Well, not many know about Code of Partnership happening in India, and at my hometown Chennai. Code of Partnership is another congregation / workshop organised by Forum Nokia to leverage and motivate the developer base in WRT platform. It is a One day event hosted at Chennai and the list of speakers include Mr. Prakash Sayini – Forum Nokia India Head, Mr. Sunil Rao, Developer Relations Manager, Forum Nokia and my very friend from Bangalore Mr. Balagopal who works as a Technology expert at Nokia. I think the main motive of this event is to evangelize developers to the WRT platform, but wonder why the registration has been made Invite-only. You can read more, here. And as it appears from the site, Forum Nokia developer Conference 2009 is on its way. Today Adobe Systems today announced the immediate availability of Adobe® Media Player 1.0 software. An Adobe AIR™ application, this customizable, cross-platform media player provides exciting new ways for viewers to discover and interact with their favorite content, while offering revenue and brand-building opportunities for content publishers. Major television broadcasters and leading content publishers, including CBS, MTV Networks, Universal Music Group, PBS, CondéNet, and Scripps Networks have worked with Adobe to provide a broad range of television programming and entertaining video content to viewers. Additionally, Adobe announced Adobe TV, a network in Adobe Media Player with a series of shows that provides expert instruction and original series programming about Adobe products to the worldwide creative community (see separate press release). Adobe Media Player is available for immediate download at http://www.adobe.com/go/mp . Adobe Media Player can provide high-quality playback of streamed, downloaded or locally-stored video in the Adobe Flash format. For the first time, consumers can download video outside the browser in the Adobe Flash format, which can be viewed in 1080p, 720p or 480i video display resolutions with the most advanced audio quality. Users can also subscribe to television shows and other online video content and then automatically receive new episodes of the shows as they become available. To help viewers discover new content, a broad, searchable catalog of shows from leading media companies and networks is available and it is expected that it will continually expand to include video from additional broadcasters, studios and independent producers. Some of the initial content available on Adobe Media Player includes: CSI: New York, CSI: Miami, Big Brother, Star Trek, Melrose Place, Hawaii Five-O, The Twilight Zone and MacGyver from CBS; clips from The Hills, MTV News and Yo! MTV Raps from MTV Networks; select shows on HGTV, Food Network, DIY Network and Fine Living Network from Scripps Networks; Epicurious.com, Style.com and Wired.com from CondéNet; PBS programming and music videos from Universal Music Group. Additional content from MTV Networks’ brands including MTV, Nickelodeon, COMEDY CENTRAL, VH1, CMT, Logo, Spike, The N, GameTrailers and Atom Films will be made available over the next several months. Adobe Media Player provides content owners and media publishers with new ways to distribute, measure and build businesses around video content. Unlike existing media players, Adobe Media Player enables viewers to subscribe to free content, giving them control to watch their favorite shows both online and offline. The player also offers next-generation offline monetization and branding options, including viewer-centric dynamic advertising for targeted marketing campaigns and the ability to customize the look and feel of the player to match the brand or theme of the video content. Adobe Media Player can also provide content publishers with anonymous measurement of content usage data, such as when and how often a video has been viewed, in addition to supporting protection options such as protected streaming, advertising protection and video DRM protection. Leveraging Adobe’s Emmy® Award winning Flash® architecture, Adobe Media Player is a key part of Adobe’s ecosystem for the creation and delivery of next-generation broadcast entertainment. It complements and leverages other Adobe components, including: Adobe Flash Player; Adobe Flash CS3 Professional; Adobe Flash Media Server 3 software for streaming media applications; Adobe Flash Media Rights Management Server for content protection; Flash Lite™ mobile video playback technology; Adobe’s range of media authoring tools such as Adobe Creative Suite® 3 Production Premium software for video, audio and motion graphics production; and Adobe Media Encoder for compression and live streaming. Adobe Media Player is an Adobe AIR software application, a revolutionary cross-operating system runtime that brings rich Internet applications to the desktop. Adobe revolutionizes how the world engages with ideas and information – anytime, anywhere and through any medium. For more information, visit www.adobe.com . Announcing: Hyderabad BarCamp6 – I will be there!! 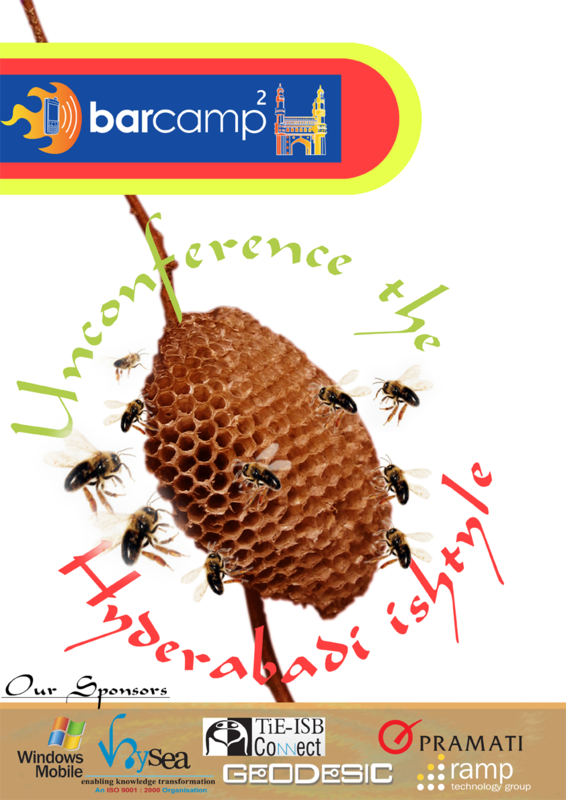 Barcamp6 Hyderabad is back with BANG!! For me its a bit of surprise, last Barcamp 5 was held @ google on Feb 16(not so far you see). Slated for March 28th at IIIT Campus, Hyderabad. Theme is Product. Join me for this event by registering yourselves here. The event will be an opportunity for the technology and products fraternity to interact and network as also to highlight the support eco-system available in Hyderabad for new products and startups. Apart from showcasing products being built out of Hyderabad, leaders from Product companies and the VCs/Academicians share experiences building IP and products. Spread the word! Barcamphyderabad3 has arrived as soon as Barcamphyderabad2 finished with great expectation with focus on Mobile Applications and Infrastructure. Barcamphyderabad3 has focus on Consumer/Enterprise software opportunities around Web 2.0 communities.Its URL is – http://barcamp.org/BarCampHyderabad3 and you can register here. It is being held in INFOSYS TECHNOLOGIES, Hyderabad on December 16th, 2006 (Saturday), 1 PM. I will posting the route map later this date. The BarCamp2 at Hyderabad, on Mobile Applications and Infrastructure went off very well which was held in Microsoft Campus here in Gachibowli, Hyderabad. There was an unprecedented security inside the campus having security guards with 30 feet distance from each other. Never seen like this in any other companies. Its too far from my house in Himayathnagar. Post Barcamp2, my work got hectic and now found time the scribble this note. I could not present my topic due to lack ot time for my preparation on flashlite. I lost the chance. 😦 But found very interesting presentation from Sriram, an young product manager from MS. Prof. Vishal from Centre of IT in Building Science, IIIT-H gave a very interesting presentation. It added a whole new idea to me that can be done with my flash mobile content delivery. Will surely pursue this. Mohit gave me very good presentation on Bootstrapping on webenterprise. More important presentation was from Damodar Rao from Dolphin Computers, Behrampur, Orissa, India. He did gave his product demo of his application for rural man. It was very nice to hear from a guy deep inside remote state of Orissa unlike guys from big cities. And at last, we had very constructive panel discussion with Kiran Bir Nag From SVB, TIE Director Mr. Chaudhri, Ms Anuradha from Ocimum BioSciences, Devendra Surana from Surana Telecom, and Prof Vishal from Centre of IT in Building Science, IIIT-Hyderabad. Met lot of interesting people and came to know lot of new things which were outside of my domain.Can’t wait for the next camp. Here BarCampHyderabad2 is announced. Slated for July 15th at Microsoft Campus, Hyderabad. Theme is Mobile Applications and Infrastructure.